This article is about the 1954–1963 model. For the 1985–1989 Mercedes 300 SL, see Mercedes-Benz R107. For the 1989–1993 Mercedes 300 SL, see Mercedes-Benz R129. For the Grand Prix race car 1952 Mercedes 300 SL, see Mercedes-Benz W194. The Mercedes-Benz 300 SL (chassis code W 198) was produced from 1954 to 1963. It was first produced as a coupe from 1954 to 1957 with gullwing doors and then from 1957 to 1963 as a roadster. The direct fuel injected production version was based on the company's less powerful carbureted overhead camshaft straight-6 engine 1952 racer, the W194. Mercedes-Benz introduced the 300 SL in February 1954 at the International Motor Sports Show in New York instead of in Europe and was largely the marketing creation of Max Hoffman. It was voted the "sports car of the century" in 1999. The 300 refers to its engine displacement of 300 centiliter or more specifically 2,996 cc (182.8 cu in). SL is the short form for "super-light" in German and refers to the light tubular frame construction. The 300 SL (also called W 198) goes back to the racing sports car, Mercedes-Benz W194, which had already had the name "300 SL". In 1951, Daimler-Benz had decided to take part in races again in 1952 and to build a sports car for this purpose. 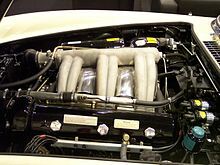 To achieve a sufficient performance for racing, the existing engine of the Coupe 300 S (M 188) had to be further developed. In 1952, the W 194 took part in the most important races of the year. The new SL competed at the Mille Miglia at the beginning of May and achieved second place. It won the top three places at the Bern Sports Car Prize 131.04 kilometres (81.42 mi). At the 24-hour race at Le Mans the 300 SL gained the top two places. First place went to Hermann Lang and Fritz Riess with an overall average 155.575 kilometres per hour (96.670 mph), they achieved a new record in Le Mans history. Second place went to Theo Helfrich and Helmut Niedermayr. A race at the Nürburgring ended with a four-fold success. 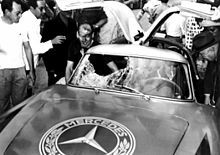 At the Carrera Panamericana in Mexico, the 300 SL again won with Karl Kling and Hans Klenk – despite a vulture flying through the windscreen. These successes, especially those on the high speed open road races, were rather surprising as the W194 engine was fitted only with carburetors, producing 175 hp (130 kW), which was not only less than the competing cars by Ferrari and Jaguar, but also less than the 300 SL road car developed from it and introduced 1954. Low weight and low aerodynamic drag made the W194 fast enough to be competitive in endurance races. Mercedes-Benz developed a new version for the 1953 racing season. Chassis number 0011/52 was called the "Hobel", or carpenter's plane because of its distinctive front end, added fuel injection and 16-inch wheels. The gearbox was installed on the rear axle. Its body was made of Elektron, a magnesium alloy, to reduce the weight by 85 kg (187 lb). However, the car was not used because Mercedes-Benz decided to take part in Formula One from 1954 onwards. Later versions revised the body for lower air resistance and did not adopt the transmission arrangement. The two sports cars premiered at the "International Motor Sports Show" in New York, which took place from 6 to 14 February 1954. Mercedes-Benz experienced a very positive visitor response to the 300 SL and the 190 SL at the Motor Show. Serial production began in August 1954 at the Sindelfingen plant. Shortly after the start of production or from the 51st car, the long shift lever, which meshed directly with the transmission, was replaced by a shorter one with a shift linkage. The first W 198 was first sold in Europe in 1954 and in August 1954, the first vehicle was exported to the USA and sold to Briggs Cunningham. Of the 1400 Coupes built in total, the largest part, about 1100, reached the US. More than 80% of the vehicle's total production of approximately 1400 units were sold in the US, making the coupe the first Mercedes-Benz widely successful outside its home market and thoroughly validating Hoffman's prediction. The 300 SL is credited with changing the company's image in America from a manufacturer of solid but staid luxury automobiles to one capable of rendering high-performance sports cars. The 300 SL's main body was steel, with aluminum hood, doors, dashboard and trunk lid. It could also be ordered with an 80 kg (176 lb) saving all-aluminium body but only 29 were made.. Even with the upward opening doors, the 300 SL had an unusually high sill, making entry and exit from the car's cockpit problematic. A steering wheel with a tilt-away column was added to improve driver access. Initial sales were sluggish due to several things. While initial prices were about $6,800 a new Chevrolet Bel-Air could be purchased for $1,700 in the same year. Then there were few mechanics, even at the dealers, who understood the fuel injection system enough to do repairs. A 1955 Coupe was removed from the showroom to a warehouse as unsellable and was finally sold at dealer cost. The price of the 300 SL was set at 29,000 DM while a 1953 Mercedes 170 Vb cost 7900 DM. 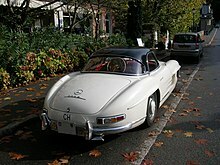 The 300 SL in 1954, was not the most expensive car in the Mercedes program as the W 188 cost 5500 DM more. Mercedes-Benz did not announce what the abbreviation "SL" meant when the car was introduced. Leicht is either "easy" as an adverb or "light" as an adjective in German. Defining a car it has to mean "light". It is often assumed that the letters stand for Sport Leicht. One car magazine in 2012, declared that the abbreviation "SL" - "securitized and personally signed by Rudolf Uhlenhaut " meant Super Leicht. This contradicts "Mercedes-Benz 300 SL" of Engelen / Riedner / Seufert, which was produced in close cooperation with Rudolf Uhlenhaut showing that the abbreviation meant Sport Leicht. Mercedes-Benz used both forms until 2017. It was even called Super Super. On the company website it was called Sport Leicht until 2017 and then changed to Super Leicht. For a long time it was unclear what intention the company had at the time when assigning the letter combination. It was not until the beginning of 2017 that a chance finding in the corporate archive clarified that the that the abbreviation SL stood for Super-Leicht. The car has a tubular frame with an attached (not self-supporting) body. The engine is longitudinally mounted at the front and drives the rear wheels. The maximum speed of the 300 SL is 260 km/h (162 mph) , depending on the rear axle ratio. The coupe gas tank had a capacity of 130 litres (34 US gal). The enormous fuel tank capacity also caused a considerable difference in handling depending on the quantity of fuel on board. The roadster, due to its low pivot swing axle and extra trunk space got a 100 litres (26 US gal) tank. As is the case with contemporary racing cars, the 300 SL had a tubular frame designed by Rudolf Uhlenhaut. This ensured a high stability with low vehicle mass. Thin straight chrome-molybdenum tubes were assembled as several triangles and the finished frame weighs 82 kg (181 lb). The tubes make a deep side panel so gullwing doors are needed to enter the car.. The frame on the coupe had two siderails with the top tube at the level of the driver's elbow. The center of gravity is almost exactly in the middle of the vehicle. The chassis was a regular Mercedes-Benz W186 but with a sportier tuning. Unlike many cars of the 1950s, steering was relatively precise and the four-wheel independent suspension allowed for a reasonably comfortable ride and markedly better overall handling. However, the rear swing axle, jointed only at the differential, not at the wheels themselves, could be treacherous at high speeds or on imperfect roads due to extreme changes in camber. The front wheels are hung on double, unequal length wishbones with coil springs and hydraulic telescopic shock absorbers and a torsion bar stabilizer was installed. The Coupe's rear axle was of a two joint design with one joint at each side of the differential at its center line. The coupe's wheels were 5K × 15 inches while the Roadster was slightly larger at 5.5 x 15 inches. The wheels were steel bowl/aluminum rim rivet compound wheels. A valuable option were the Rudge rims 5J × 15 inches. The tires are 6.50-15 inches or current tire size 185 VR15. The 300-SL Coupe had drum brakes with cooling fins with a diameter of 26 centimetres (10 in). A brake booster was used to reduce the pedal force. The brake booster works by using the negative pressure in the intake manifold. Brake shoes were 90 millimetres (4 in) wide. The front drum brakes were 2 wheel brake cylinders/wheel, rear drum brakes were 1 wheel brake cylinder/wheel The handbrake was a mechanical parking brake that acts on the rear wheels. The steering gear was a recirculating ball steering. The body of the 300 SL Coupe consists mainly of sheet steel, the hood, the boot lid, dashboard, the sill and door skin, however are made of aluminum. Silver gray was the standard color. Other colors were available on request. The objective of the body design was to make the vehicle as streamlined as possible. In order to keep the frontal area small, the bodywork was slightly retracted from the window line. Only after the construction of the frame, which went far to the top, was noticeable that conventional doors could not be used because of this frame construction on the vehicle flanks. The eye-catching Gull-wing doors were therefore necessary because of the vehicle design which is why the car got its "Gullwing" name. A discreet rod swung out of the door as a handle to unlock the doors, unlocking the lock and swing the door supported by two telescopic springs. The car has a Straight-six engine of the M 198 with 2,996 cubic centimetres (183 cu in) of displacement, which is technically based on the Mercedes-Benz W186. The 300 SL has a direct fuel injection instead of the two carburetors of the M 186. A dry sump lubrication was installed, to ensure good oil lubrication at high speed cornering and to reduce the height of the oil pan. The standard camshaft for the Coupe delivered 215 hp (160 kW). The optional Sports cam shaft delivered 240 hp (179 kW). The Sports Cam shaft was offered at no extra charge when ordered at the factory. The Roadster was delivered with a Sports cam shaft only, therefore delivering 240 hp (179 kW). In order for the engine to be installed in the flat car, the engine was tilted 50 degrees to the left or to driver side. Clutch operation was initially very heavy, remedied by an improved clutch arm helper spring which reduced pedal force. From March 1963 to the end of production later that year, a light alloy crankcase was used on a total of 209 vehicles. Every engine was thoroughly tested for 24 hours on a dynamometer with six hours under a full load at 6,000 rpm. Like the W194, the 300 SL borrowed its 3.0 litre overhead cam straight-6 from the regular four-door 300 (W186 "Adenauer") luxury tourer introduced in 1951. Featuring an innovative diagonal aluminum head that allowed for larger intake and exhaust valves, it was canted 50 degrees to the left or to driver side to fit under the SL's considerably lower hoodline. In place of the W194's triple two-barrel Solex carburetors, a groundbreaking Bosch mechanical direct fuel injection was installed, boosting power almost 25% over the Gran Prix car's. Derived from the DB 601 V12 used on the Messerschmitt Bf 109E fighter of World War II, it raised output from 130 kW (175 hp) to 160 kW (215 hp), almost double that of the original Type 300 sedan's 86 kW (115 hp). An optional, even more powerful version, with radical camshaft developed 240 hp (179 kW) at 6100 rpm and a maximum torque of 294 N⋅m (217 lb⋅ft; 30 kg⋅m) at 4800 rpm, but was rough for city use. The result was a top speed of up to 260 km/h (160 mph) depending on gear ratio and drag, making the 300 SL the fastest production car of its time. As standard, three checkered patterns fabrics were available for the seat cover. The combinations of the basic colors were, gray/green, gray/blue and cream/red. Most customers opted for leather upholstery, which later became standard on the Roadster. Behind the driver and passenger seats, a storage space for luggage is available at the Coupe, as the trunk is largely filled in the rear by spare wheel and vehicle tank, including tank filler neck. However, if luggage is carried in the room behind the seats, the rearview mirror can hardly be used. The side windows are not retractable, but there are forward triangular vent windows. In mid 1956 Mercedes was evaluating what to do with the coupe. Sales had started to fall off and either the car would be discontinued or there would have to be a model change. The board decided to create a roadster version to meet the needs of the California market. Sales of the Roadster exceeded those of the coupe but took seven years while the coupe was only in production for 4 years. The rear axle was changed to a single joint arrangement with its pivot point located 87 mm below the differential center line. This gave improved handling and increased comfort and less camber change and better handling in corners. Uhlenhaut wanted the new low pivot axle for the Coupe , but was voted down by the Board of Directors, reminding him that 3000 manufactured axle units remained at the factory, and costs were already getting very high for this car. In March 1961, the air-cooled drum duplex brakes were replaced by modern Dunlop disc brakes. The cloth top of the Roadster can be stored under a flap behind the seats. From Autumn 1958 a hardtop was an available option. Werner Engel won the 1955 European Rally Championship driving a 300 SL. At the 1955 Mille Miglia, Fitch / Gendebien won the class. in addition to the victory of Stirling Moss a class victory on the 300 SLR racing car. The marathon rally Liege-Rome-Liege was won in 1955 Olivier Gendebien and won in 1956 by Willy Mairesse. In the United States, Paul O'Shea became a champion in the Class D racing class in 1957 with the Roadster built by the racing department in Stuttgart for use in the United States, ahead of Carroll Shelby by the Sports Car Club of America on a Maserati. The car also had a victory in the Rali Vinho da Madeira in 1960. The car had a top speed of 160 mph (257 km/h) vs 180 mph (290 km/h) for the Ferraris and Maseratis it competed against. Instead, it was to be the most durable and able to maintain its top speed for over 11 hours in some races. Bob Sirna, a previous president of the Gull Wing Group International organization beat the Bonneville Speedway F/GT speed record in 2016 in a highly modified 300 SL Gull Wing, establishing a new mark for 3L Sport cars of 190.759 mph. The car was stripped and a large hood scoop was installed. Amongst others, the Last Shah of Iran: Mohammad Reza Pahlavi, Wernher von BraunFormula 1 driver Rob Walker, Juan Manuel Fangio, Juan Peron, Tony Curtis, Pablo Picasso, Sophia Loren, Romy Schneider, Clark Gable, Glenn Ford,, race car driver Briggs Cunningham, Ferrari's Luigi Chinetti, John von Neumann, Pierre Trudeau and Justin Trudeau owned 300SLs. As well, Paul Newman, Yul Brynner, Bernie Ecclestone, Ralph Lauren, Adrian Conan Doyle owned coupes. A smaller, slightly heavier, less luxurious and much cheaper 1.9 liter roadster using the Ponton class 4-cylinder engine was introduced in 1955 as the 190 SL. Both the 300 SL and the 190 SL were followed in the Mercedes line by the 230 SL. The more modern 426 kW (571 hp), nearly 320 km/h (200 mph), gull-winged Mercedes-Benz SLS AMG is regarded as the 300 SL Coupe's spiritual successor. Today, the 300 SL with its gullwing doors, technological firsts, and low production numbers is considered one of the most collectible Mercedes-Benz models, with prices generally in the US$1,000,000–2,500,000 range. Sports Car International magazine ranked the 300 SL as the number 5 sports car of all time. A pair of 300 SLs for sale in 2009 were offered at over $1.3M USD from the Foxwood Collection. In 2012, an ultra rare 1955 Mercedes-Benz 300 SL with an all-aluminum body was sold for US$4.62 million at the Scottsdale Auctions in Arizona. Subsequent generations of the Mercedes-Benz SL-Class have been continually produced such as the Mercedes-Benz W113 (1963–71) and the Mercedes-Benz R129 (1989–2001). In the 2000s Mercedes oriented its SL series back towards performance, and included styling nods to the 300 SL. However, the SL has since evolved to become a more autobahn-focused grand tourer due to increasing weight, especially with its optional V12 engine in later iterations. The last two generations of the SL are hardtop convertibles with technological and comfort amenities. A limited edition, Mercedes-Benz SLR McLaren, a Mercedes-Benz-McLaren Automotive joint venture that featured a hand-built all-aluminum 5.4 l (330 cu in), 626 PS (460 kW; 617 hp) supercharged V8 was introduced in 2003. A 571 PS (420 kW; 563 hp) 6.2 l (380 cu in) V8 powered Mercedes-Benz SLS AMG made its debut in 2009. Described by Mercedes as a spiritual successor to the 300 SL Coupe, it peaked at 631 PS (464 kW; 622 hp) in the 6,208 cc (378.8 cu in) Coupe Black Series introduced in 2013. SLS AMG production was brought to a close at the end of 2014. The SLS AMG has now been replaced by a substantially less costly tourer called the AMG GT with traditional doors and a much smaller twin-turbo V8 engine, designed to compete against the Porsche 911 and Audi R8. Markus Bolsinger, Jürgen Lewandowski, Harry Niemann: 50 Years Mercedes-Benz 300 SL. Delius Klasing Verlag, Bielefeld 2004, ISBN 3-7688-1512-9. Mercedes 300 SL - The Gullwing. (Alternative title: Auto-Icons, Mercedes 300 SL. ) Documentary, Germany, 2016, 29:44 Min., Director: Tilman Achtnich, Production: SWR , Series: History in the Southwest , Auto-Icons , First broadcast: March 27th 2016 SWR Fernsehen, Inhaltsangabe von ARD und online-Video. Legends of the street. Car treasures in the Mercedes-Benz Museum. Documentary, Germany, 2011, 28:41 Min., Camera: Wolfgang Breuning, Production: SWR , First broadcast: June 9, 2011 by SWR Fernsehen online-Video. Louis Malle film, Lift to the Scaffold where one gets shunted, and eventually left on a Paris bridge with the engine running. 260 km/h (162 mph) (3.25:1) "according to axle ratio"
^ a b Oswald, Werner (2001). Deutsche Autos 1945–1990, Band 4. Stuttgart: Motorbuch Verlag. ISBN 978-3-613-02131-0. ^ Werner Oswald: Mercedes-Benz Personenwagen 1945–1985. Motorbuch Verlag, Stuttgart 2007, ISBN 978-3-613-02778-7, S. 46 u. 70. ^ a b c d e LaPalm, Julia (2013-01-09). "Uberbird: The Most Important Postwar Benz of Them All". Motortrend. Archived from the original on 2018-12-27. Retrieved 2018-12-25. ^ Bernd Ostmann: Mercedes-Sportwagen. Gipfeltreffen von drei Generationen. Archived 2017-04-09 at the Wayback Machine In: Auto motor und sport, 12 February 2011. ^ Benjamin Bessinger: Mercedes-Konzernarchiv. 15 Regalkilometer Autogeschichte. Archived 2018-09-10 at the Wayback Machine In: Die Zeit, 14. April 2017, S. 2. ^ Michael Rieder: Urahn-Forschung. In: Motor Klassik, 1989, Heft 5, S. 14. ^ Daimler-Media: "Der Mercedes-Benz 300 SL (W 194) mit der Chassisnummer 11". Media.daimler.com. 2012-03-26. Retrieved 2017-07-25. ^ a b c d e f g h i j k l m n Nitske, Robert (1974). Mercedes-Benz 300 SL. Motorbooks International. ISBN 978-0879380212. ^ a b c Die klassischen Mercedes SL. Motor Klassik, Spezial Nr. 3, Vereinigte Motorverlage, Stuttgart. ^ a b Weijola, Stefan. "First Among Equals – The Briggs Cunningham Gullwing". Archived from the original on 2019-01-20. Retrieved 2019-01-20. ^ Rüdiger Etzold: Der Käfer. Band 1, Motorbuch Verlag, Stuttgart 1983, ISBN 3-7168-1582-9, S. 230. ^ "300 SLR Tech Report". Sports Car Illustrated. 1 (10). April 1956. ^ Motorsport als Zündfunke: Der Mercedes-Benz 300 SL Rennsportwagen der Baureihe W 194 (1952–1953). In: media.daimler.com, aufgerufen am 25. Juli 2017. ^ Foto: Dokument des Namenvorschlags Archived 2018-12-24 at the Wayback Machine in: Die Zeit, 14. April 2017. ^ Read, Simon (1975). Stuttgart's Immortal 300 SL (vol 18 no 2 ed.). Automobile Quarterly. pp. 116–130. ^ a b FASZINATION. ISBN 978-3613305144. ^ a b Mercedes-Benz 300 SL. Test in Auto, Motor und Sport, Motorbuch Verlag, Stuttgart, Heft 21/1955, Reprint in Motor Klassik, Spezial Nr. 3. ^ Thomas Imhof, Mercedes SL, Moevig 1990, S. 20. ^ a b Mercedes 300 SL Technical data booklet (MB order no. 6510 1257 00 ed.). DAIMLER-BENZ AKTIENGESELLSCHAF. 1957. ^ a b Mercedes-Benz Workshop Manual Type 300SL. DAIMLER-BENZ AKTIENGESELLSCHAF. 1956. ^ Rohde, Michael; Koch, Detlev (2000). Typenkompass Mercedes-Benz. Stuttgart: Motorbuch Verlag. p. 41. ISBN 978-3-613-02019-1. ^ "Detailed technical specifications". Automobile-catalog. ^ "1954→1957 Mercedes-Benz 300 SL Coupe". Supercars.net. ^ Heilig, John (1997). Mercedes-Benz SL. MBI. ISBN 978-0760303283. ^ a b Adler, Dennis (1994). Mercedes-Benz 300 SL. Motorbooks International. ISBN 978-087938882-9. ^ Fitch, John (1975). Two Decades Later. Flying Low in the 300 SL (18 #2 ed.). Automobile Quarterly. pp. 131–133. ^ "Mercedes-Benz In The US". In Aller Welt (66): 242–243. 1963. ^ Bain, Don (10 August 2011). "Pablo Picasso's MB Gullwing immortalized, off to Pebble Beach". Torque News. Archived from the original on 6 March 2019. Retrieved 3 March 2019. The famous artist and renowned co-creator of cubism had many lovers but few cars, and his favorite car – the one he held on to the longest – was his Mercedes-Benz 300 SL Gullwing. ^ Engelen/Riedner, Mercedes-Benz 300 SL, S. 242f. ^ "Trudeau's vintage Mercedes slated for overhaul". The Globe and Mail. December 6, 2003. ^ Le Moine, Eric (2012). Mercedes-Benz 300 SL Coupé / Gullwing Register #198.040 & #198.043 (2 ed.). ^ a b "Mercedes 300SL Gullwing". Archived from the original on 7 October 2008. Retrieved 16 December 2007. ^ a b "Rare 1955 Mercedes-Benz 300SL Alloy sells for record $4.62 million". Autoblog. Archived from the original on 23 April 2012. Retrieved 8 May 2012. ^ Schultz, Jonathan (2012-03-20). "2013 SL65 AMG Muscles In on SLS AMG Roadster - NYTimes.com". Wheels.blogs.nytimes.com. Archived from the original on 2012-03-25. Retrieved 2012-05-11. ^ Michael Bettencourt (2012-04-03). "2013 Mercedes-Benz SL 550: A luxury retreat". The Globe and Mail. Archived from the original on 2012-05-23. Retrieved 2012-05-11. ^ Damon Lowney. "Mercedes SLS AMG GT Final Edition marks end of AMG's first sports car". Autoblog. Archived from the original on 2015-01-29. Retrieved 2015-02-14. ^ a b Zal, Pawel. "1954 Mercedes-Benz 300 SL opt. 3.42 axle". Automobile-catalog.com. Retrieved 2018-12-08.